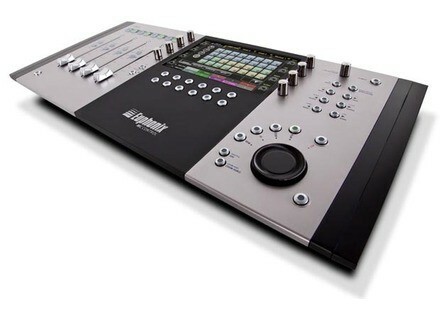 MC Control v2, Motorized MIDI Control Surface from Euphonix. Product replaced by the Avid Artist Control V2. Euphonix has announced MC Control v2, the latest addition to its line of Artist Series media controllers. MC Control v2 features the same layout and slim line design as the MC Control, but the company says it offers enhanced graphics thanks to a new LED-backlit touch-screen and better tactile control of parameters via eight new custom rotary encoders. At the heart of MC Control v2 is a new 800 x 480 pixel LED-backlit touch-screen interface designed to offer a wide viewing angle, bright graphics and color consistency. The touch-screen not only displays all top-level project information like track names, metering (from mono to 5.1 surround data), automation mode, fader/pan values, etc., but also allows the user to solo/mute/record arm tracks, trigger Soft Keys, perform surround panning, and much more directly from the surface. MC Control v2 ships with Soft Key sets for most media applications, and custom Soft Keys can easily be created for almost any function from basic keystroke shortcuts to complex macro commands for each application. Surrounding the touch-screen, MC Control v2 features eight new touch-sensitive rotary encoders that offer direct control over everything from panning and gain to editing plug-in and EQ parameters, and can be pressed to instantiate and navigate through parameters. MC Control v2's ergonomic layout includes dedicated transport controls as well as a data entry wheel that can be assigned on the fly to control everything from basic jog/shuttle navigation and zooming to a host of advanced editing functions. 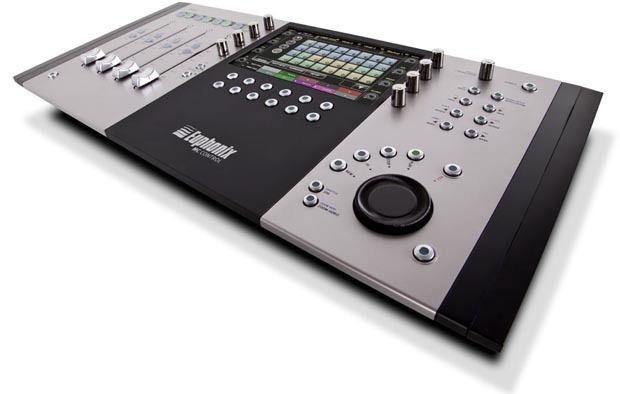 Four touch-sensitive motorized faders round out the controls to deliver accurate and smooth mixing, and touching a fader automatically selects and controls the corresponding track, the company says. Like all Artist Series controllers, MC Control v2 is designed to integrate into any studio, fitting between a computer keyboard and screen, and can be used standalone or combined with other media controllers to build a larger, integrated media control surface. MC Control v2 features EuCon, a control protocol developed by Euphonix that enables simultaneous control of multiple applications and even workstations over an Ethernet cable at 250 times the speed and eight times the resolution of MIDI. EuCon automatically detects whatever application is in the foreground and instantly sets all controls and high-resolution touch-screen display to match. Euphonix says it has worked with software developers like Apple, Steinberg, MOTU and others to integrate native EuCon support into their audio and video applications to provide high-resolution, high-speed control over almost all software functions for an unmatched editing and mixing experience. Sugar Bytes Updates Effectrix to v1.3 Effectrix now offers a swing function, midilearn and automation for the fx lane on/off buttons and more improvements. eaReckon Updates BloXpander eaReckon has updated BloXpander to v1.0.5. QuikQuak Updates Fusion Field 2 QuikQuak has updated Fusion Field to v2.60, which includes the release of a 64-bit version for Windows x64.